I think, particularly when we’re young, we’re taught that certain things are not okay to eat, which to Little Heather translated to “poisonous” but which was actually “maybe not that tasty to some people.” Just last month I learned that bay leaves can be consumed. Thirty-two years old and I somehow got by thinking they can be used in a broth but are (I guessed?) deadly if eaten. Foolish girl! Allow me to free your mind if it’s not already been freed: Unless you are using carrots as a garnish, peeling them is a waste of your time and of the carrot’s sweet sweet vitamins. Just scrub them well! And if you cut florets off your heads of broccoli and toss the stems, you’re losing out on a) half of what you paid for and b) a flavorful, crunchy vegetable packed with fiber and protein. Friends, liberate yourselves. Let’s enjoy some carrots (with peel) and broccoli stems by bulking up a turkey burger that’s laced with the flavors of Thailand (that holy quartet of salty, sweet, hot, and sour). I usually prefer a one-dish meal on a weeknight, but that means I need it to satisfy more than one food group (of chief importance to me at supper are protein and vegetables). This burger sneaks a few vegetables inside the patty and adds a few more on top as garnish. In place of dill pickles or sliced onion, I made a quick pickle (which around here, we call a quickle) to cover both bases. It’s crunchy, sour, and a little sweet, all at once. Some spinach instead of traditional lettuce and a generous dollop of peanut sauce both give you a familiar-looking burger with a very nontraditional taste. Oh, and if you want to use other veggies in this burger, go right ahead. I’ve successfully swapped in bell pepper, snow peas, water chestnuts, and of course broccoli florets. Just make sure whatever you toss in is finely chopped and try to keep the proportions of meat to veg similar (too much veg makes a crumbly burger). I hope you’ll try this burger and let me know what you think in the comments. And if you eat any part of a vegetable or fruit that other people find strange, do tell! Make the quickle: In a small bowl, toss together onion, vinegar, honey, and salt. Wash cucumber thoroughly to remove any wax and then, using a vegetable peeler, peel thin strips from it. Turn the cuke as you go to maintain thin strips. Stop when you reach the seedy core and discard. Roughly chop pile of shaved cucumber and toss with onion mixture. Make the peanut sauce: Using an immersion blender or a spoon and some elbow grease, combine peanut butter, rice vinegar, soy sauce, water, garlic, sesame oil, chili-garlic sauce, honey, ginger, and fish sauce. Make the burgers: Set aside 1/4 cup of peanut sauce and add the rest to a bowl with turkey, carrot, broccoli, green onions, cilantro, salt, and red-pepper flakes. Mix well with your hands and form into 4 patties. Heat a grill, grill pan, or skillet to medium-high. Spray with nonstick spray and add patties; cook for 3-4 minutes per side (with a grill press, cook for 5 to 6 minutes total) until cooked through. 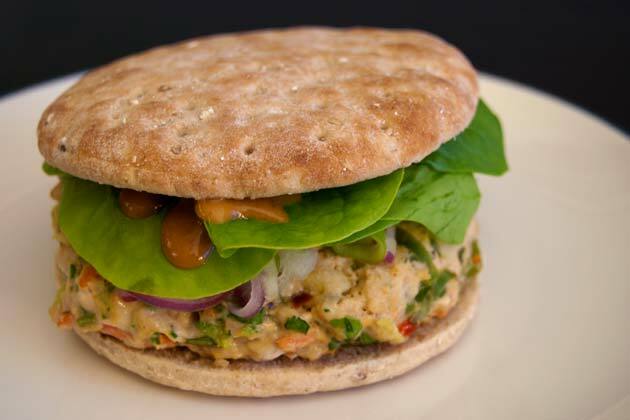 Assemble each burger on a bun with a patty, some quickle, a few spinach leaves, and a dollop of reserved peanut sauce.